For the past nine months, I’ve interviewed various actors and celebrities for Glamour, and I’ve always kept it very business like (even if on the inside I’m freaking out the way I do when a crush asks me out on date). Well, that streak of professionalism is over thanks to the incredible funny and talented Wendi McLendon Covey. I’ve been a huge fan of hers since I started watching Reno 911! in college—and looking back on it now, it probably inspired me to do improv (Reno was a heavily improvised show). So when I found out a few months ago that she’s starring in a new family sitcom set in the 1980s that premieres September 24, The Goldbergs, I was excited and knew I had to sit down and chat with her. I just have to tell you that I was telling my boyfriend last night that I’m going to be interviewing you, and he was so pumped. We were talking endlessly about how much we love your work. So, congrats on The Goldbergs! How did this role come about? Wendi: I did a pilot for ABC last year that didn’t move forward. It was a weird little comedy, and I guess it didn’t fit with the lineup. So this project came up after ABC said, “Take a look at some of our other pilot scripts, but we feel like this one [Goldbergs] is something you would really respond to.” And you know what? I did. Once I read it, it was all over. I said, “Please cancel any other meetings I have because I’m doing this one.” Now, this was before Christmas time last year, and I didn’t want to audition for anything else. It was this show or nothing. That’s amazing! When I was watching the trailer, I was wondering if the videotape parts were written into the show, or if that’s something he actually did in real life. Now, one of the things I really enjoyed about the trailer is that a lot of sitcoms don’t know how to write moms. They’re either shrill or not funny. But I feel like your character [Beverly] has a strong personality. Was that something you made sure was a part of the script or was that already written? I want to back up a little bit here. I love hearing people’s origin’s stories about how they get into comedy. What’s yours? Wendi: Well, I grew up fascinated with comedy and with people who could capture someone’s attention like that. I used humor to avoid being picked on as a kid. Or I would try and make my parents laugh, so I wouldn’t get in trouble. But as a kid, I would watch Flip Wilson and I would memorize his whole routine, listen to Bill Cosby’s records constantly, Steve Martin, Carol Burnett, Lucille Ball. I just drank that stuff up and loved it. And growing up, I was the weird, theatrical kid who always tried to make people be in my plays. I’ve always loved comedy, but when it came time to figure out what I was going to go to school for, my parents were like, “Acting?! I don’t think so. No.” It took me a while to get the courage to pursue it. I had to do it in secret for a little bit, and then when I got married and was out on my own, I went for it. I had seen some shows at The Groundlings [legendary LA improvisational and sketch comedy troupe] and thought, “If I could ever do that, that would really mean something, that I have arrived.” So I went through the program and said to myself, “I’m going to stay here until they kick me out.” [Laughter] Seriously, they can ask you to leave at any point. Luckily, they never did that to me. I got into the main company in 2002 and stayed until 2009, and it was pure joy. I owe that place a lot. Do you have a favorite moment of two from your time at The Groundlings? Wendi: Yeah, when we were in the Sunday company, which is kind of the final step before they vote you into the company or vote out. You spend a lot of time in the Sunday company where you perform every single Sunday. New material almost every week. So that’s your life. You’re writing, you show your sketches on Wednesday, start costume shopping on Thursday and Friday, learn your lines Saturday, perform on Sunday. For a year and a half I did that. It’s like being in the comedy army. It’s so regimented, and you live in fear of, “Oh, my gosh, what if this doesn’t go over well?” When it goes over, it’s better than any drug. You feel so accomplished. I remember being on stage and breaking and started laughing so hard that I couldn’t collect myself for several minutes. My director said she almost blacked out the scene and went onto the next one. It’s very unprofessional, but once I get the giggles, I’m pretty much useless. I feel like the audience kind of likes seeing the performers crack up because it’s a real moment. What’s something you learned from your time with The Groundlings that you still use in your career today? Wendi: I learned how to let other performers have their moment. A lot of people can’t do that. They just chew the scenery and steamroll over their scene partners. It doesn’t make you look better in the long run to do that. You have to have balance in your scene. If it’s somebody else’s moment, let them have it. Learn how to be generous. Plus, it makes the audience hate you. I want to talk about one of my favorite shows of all time, Reno 911! How did you end up the show? Wendi: I ended up on Reno at a time when I was ready to just give up on all of it. I love the movie a lot [Reno 911! : Miami]. Is there any chance there’s going to be another movie? Wendi: Well, since the show was canceled four years ago. I doubt it. Plus, they killed my character, so there would be no reason for me to come back. Wendi: Well, you just put it out there in the universe, so who knows what will happen. I have a question about improv. I’ve done it a little bit. I’m wondering because you do a lot of scripted work as well, does your improv background make the audition process easier? Wendi: I think it does make it easier because more often than not now in auditions, you’re asked to improvise. Improv is more than just spitting out a bunch of funny stuff that’s unrelated to the material. You have to stay in character, you have to react and respond as the character you’re trying to play. You can’t just bring out the references to pop culture right now if you’re portraying someone from the ’60s. You have to service the story, and I think improv training has helped with my listening, responding, and my audition technique. It’s sounds so silly, but it’s true. Because not only do you improvise during the audition, but once you get the part, they’ll say, “Throw away everything. Just improv this scene. Do whatever you want.” Someone could panic if they’re not used to doing something like that. Was there a good amount of improvisation with The Goldbergs? Wendi: We stick pretty much to the script. They let us go sometimes. Jeff [Garlin] and I will throw something in once we’re sure they’ve gotten all the coverage they need on the written stuff. But the scripts are so good that they don’t really need improvement. We’ve got writers from Everybody Loves Raymond, The King of Queens, The Big C, all these brilliant shows. The writing on our show is there. It’s solid. The dialogue is hilarious. What’s it like working with Jeff Garlin? I imagine it’s like watching a great tennis match with you two going back and forth with the funny. Wendi: I love him. He is someone who can’t help himself from being funny at all times. Between takes, in scenes. He can’t help it. He always singing these songs we’ve made up on set and sometimes I can’t stop laughing when it’s time to shoot a scene. He is so funny, and he’s very generous and makes me and the other actors feel like we’re proud to be working on this show. Aww. 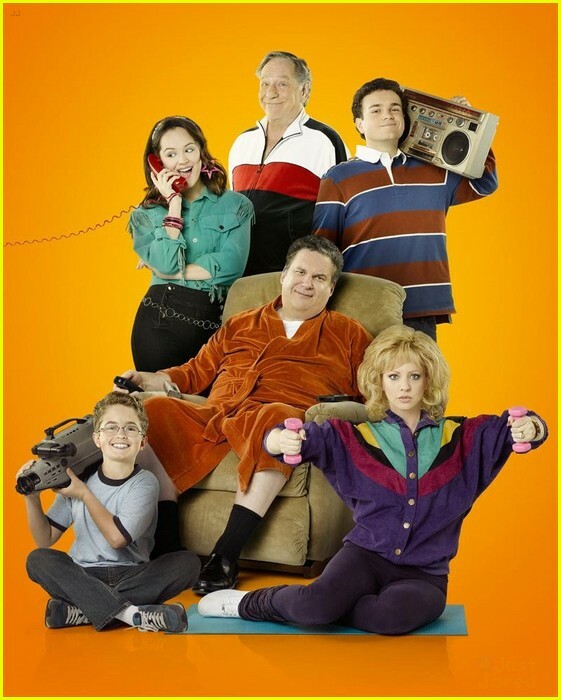 So can you tell what we can expect from the first season of The Goldbergs? Wendi: A lot of cringe-worthy family situations. [Laughter] If this isn’t funny, then I don’t know what’s funny anymore. The audience will be laughing hysterically and then a few minutes later, get a lump in their throat. It’s that good. You’re going to fall in love with these weirdos. Yeah, I mean, when you opened the shower curtain in the trailer, I was sold. Already funny. Wendi: I barge in on all my kids at some point or another. I think Beverly is having a hard time because her kids are growing up and don’t necessarily need her in the same way that they did before. And they’re onto her and her little schemes. Anyway, I’m having the best time on this show. Everything about it is pure bliss, and I really think people will like it. Previous: Big Hair! Big Personality!